I am putting up for sale a very unique piece of Porsche literature. A complete, immaculate July 1963 printed owners manual. Included also is the options booklet, repair facility booklet and what makes this super rare, the original owner's European Driver's license. It comes in the original clear plastic cover. A neighbor who bought an old service station to work on his hotrods in(he races a vintage flathead dragster) knows I like Porsches so gave this to me. I've pretty much given up on getting a 356. At least for the next decade, so am putting it up for sale. 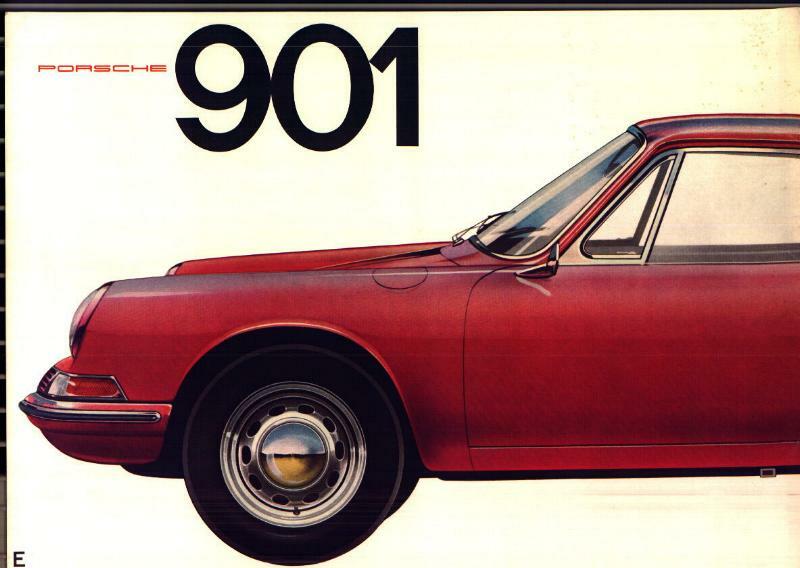 Perfect for a concours person or just someone fascinated with Porsche literature. The options booklet has a date of November 1962 printed on it and a few pen check marks inside next to options selected. The repair facility booklet has a Marz 1963 printed in Germany date. 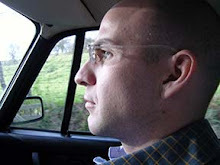 And the French Issued, European Driver's license is in the name of, Michael Stedham from Chehalis, Washington was issued on February 28th, 1963. 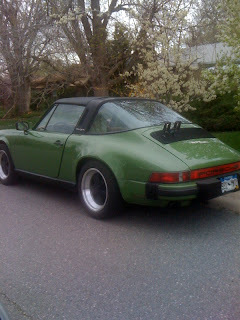 I am the biggest fan of odd, factory-color Porsches. The odder, the better. Browns, Greens, even the Pink I saw on a 964 once. With matching pink interior. So, I flipped a U-turn when I saw this SC parked near University Park in Denver. I had never seen this color green before. The car looked well-maintained too. Nice Fuchs. Good interior with Sheepskin seatcovers. The interior was caramel. Even a classic plate on it so the owner seems to be an enthusiast. Top it all off with the rad ski-rack and this SC has a lot going for it. So, anyone know the name of this color green? 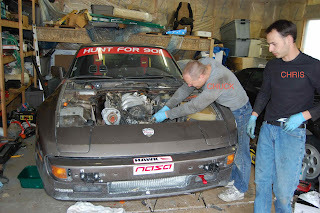 Installing 88 Engine in 83 944. Solving Wiring Issues. Chuck Taylor(national director of SPEC 944), Chris Venturini(SPEC racer) and a couple of other folks helped me install my new 944 Motorwerks engine over the weekend. The old engine was unbolted and new engine bolted in within four hours. Then it took another six or so to get the wiring worked out. Hopefully the below will help anyone in the future to do this swap. Especially as it combines the benefits of an early chassis(light weight, steel control arms, manual rack) with the benefits of the late 88 motor(higher rev limit, tad higher compression). Mating the harness of an early (1983) car and late (1988) engine and ECU is pretty straightforward. The biggest challenge being connecting the new engine harness to the old chassis harness because they have different connectors. The early car has a 9-pin square shaped connector, the later car has a rectangular 14 pin connector. Luckily, 90% of the wire colors and functions are the same. 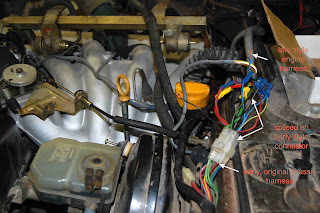 Before hooking up the wiring, it is beneficial to take the old 9-pin connector from the engine harness and use that as a base so that in the future you can easily disconnect the harness. So, what happens next is you permanently splice the pigtails from the old harness' connector onto the clipped wires from the new harness. As your splicing them It is pretty much straight forward Pin to Pin ie Pin #1 to pin #1. all the way to 9/9. All the colors match up directly except for a few. There are 2 wires on the 14 pin connector We did not use. Those are: pin #10 and pin #13. Pin #10 (blue/green) wire on the new harness. This is for the water temperature dummy light, a feature non-existent on the early chassis. So, just cap this wire, and pin # 13 red/green, is used for the air conditioner. There are now two plain black wires on the old chassis harness that we need to take care of. These emerge from the #2 and #4 positions on the connector. The number 4 black wire goes to the tach. So, a jumper wire needs to go from this wire to the black/yellow + black two wire connector that is part of the new engine harness. It is a lone split from the main engine harness and it is pretty obvious from its position that it is a dash wire. The lone remaining black wire off the old #2 connector is for the O2 sensor warmer. On a race car this is not needed. So, this wire can be capped. Or, as it is hot with ignition, used to power additional gauges, which is what I did. I used this to power the low oil pressure light and oil temperature gauge. Another gem from the craigslist file. Really bro, if I wanted to see your crusty toes I would go on vacation with you to the beach. Seriously, every photo program has a crop tool. Use it. 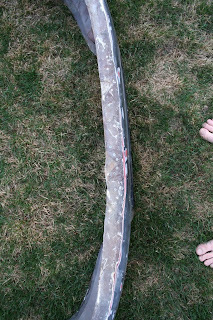 Got a 911 RS / RSR Front Bumper Spoiler for sale. Came with my dads car he didnt want it and somehow I ended up with it. 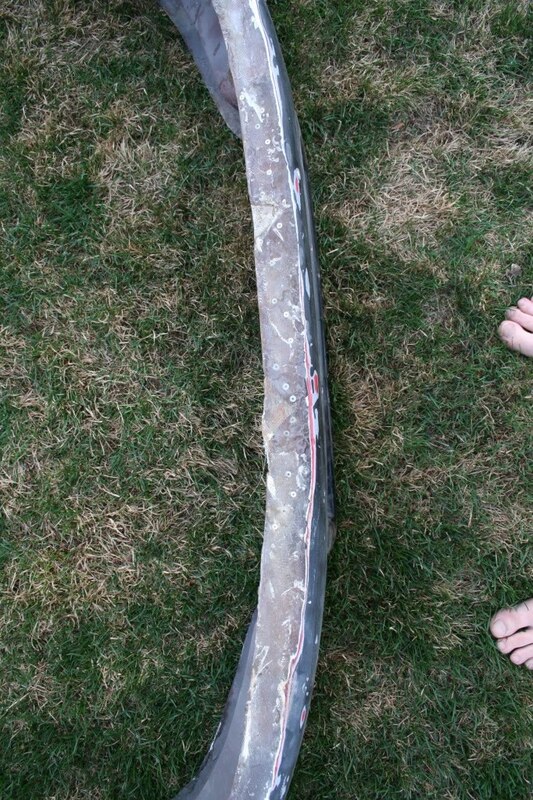 SO I dont exactly have a use for it except to sell it and fund some other car parts. Its a little bit rough but definitely fixable with a littlebit of work. Not a clue what its worth in this condition. make me an offer that I cant refuse! The hibernation period for my much coddled and loved 1983 SC is over. We are having some beautiful spring weather in Denver and I wanted to drive her to work. After being a bit dyspeptic upon startup, she soon cleared her throat and began singing her song of flat six. Ok, enough jargon. The car was a bit rough to start, but did run great after a few miles. I think it has more to do with 6 month old gas than anything else. So, I went and brimmed her to the top with Ethanol free gas from a Conoco in Lakewood. A rare find here in Colorado. And ethanol has a nasty habit of corroding the delicate CIS system. Also on the drive in, the car ticked over to 63,000 miles. I bought the car five years ago with 58,000 miles, so 1k a year average. I've always had another Porsche that I use as my daily driver so I can keep this car in pristine condition. To switch and begin driving this car everyday would be like using a new razor blade each time I shaved. I can only appreciate how smooth and effective a new blade is if I push my current blade's use until it become scratchy. Same with my daily drivers. I drive the Jeep and my stripped out SC targa all the time. So when I step into the coupe and become enveloped by the smell of aging horse hair and leather. The look of patinated carpets. The touch of the original Blaupunkt knobs. The muffled thrum of a the stock engine. It all is that much sweeter. Someone last weekend suggested I sell all four of my cars; the 82 targa, 944 SPEC, Wagoneer and this coupe and get a Cayman or used 996 GT3. They are nuts. Like eating the same thing everyday. Really, the only people who eat the same thing everyday are babies, prisoners in third world countries and the insane. Thanks to Erik from Pattern Draft Imaging, there were some nice shots of the action at PPIR. 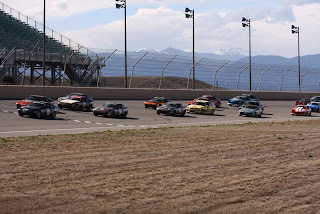 I am super appreciative as I noted yesterday that I did not take any pictures from my first race. You can check out all the pics of all the classes here. That first picture from above was of Comp School. 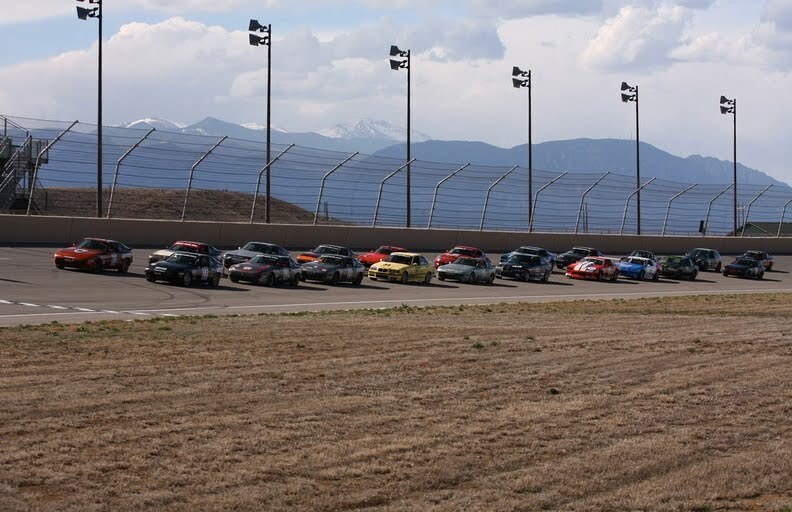 You can see it was a huge field and lots of high HP cars behind so it made for a chaotic, but good learning experience. Getting passed on both sides, etc, etc. Nothing beats experience for feeling comfortable behind the wheel. So, was it worth it? The building of the car. The money. The time. 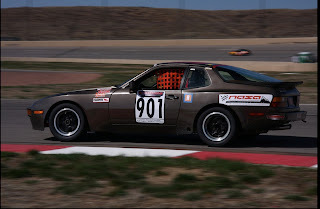 Just finished my first real 944SPEC race weekend. The #901 finished in one piece and I got a couple of more races in the books, literally. As with NASA your first 4 races are run under a provisional license and you need to get the booked signed off by the race director. This makes sure you know what the heck you are doing out there. Know the flags. Know how to hold your line. So, I have three clean races and need one more. The enduro last year, a race on Saturday and a race Sunday. How did I do? Ugh. I finished at the back of the pack. But, I am cool with that. My car needs work on getting suspension set up. 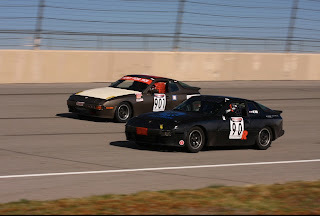 As a friend of mine, Joe Rothman who is also a PCA instructor noted after one session, "I saw your drifting display." The car, after the RA-1s warmed up got quite oversteery. Not in a snap way. But in a definite way. 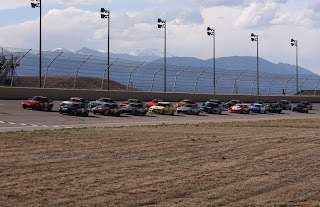 I would just watch the cars in front of me stick a turn where I would be sliding. I think I need to loosen the rear weltmeister sway more as well as lower my rear ride height some. I had never driven PPIR before. And your first time around that oval has you thinking, "did I really torque down all my suspension bits?" 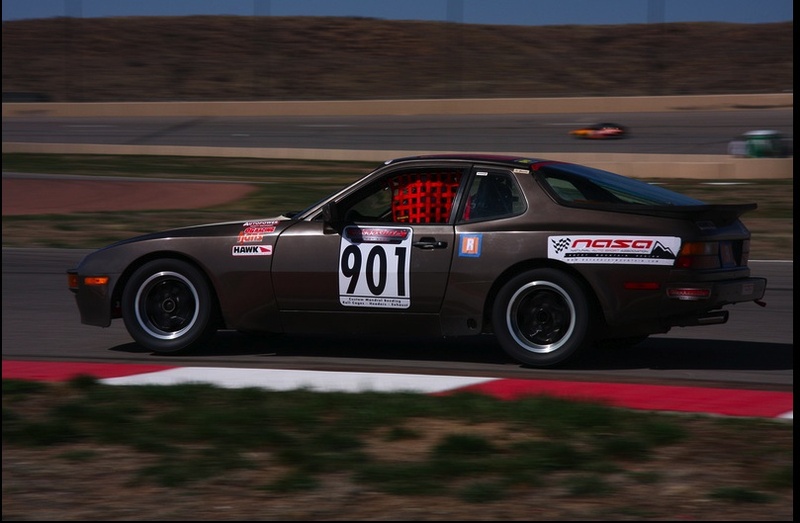 In a SPEC 944 you are foot to the floor in fourth, touching 110MPH or so as you drive around the corner. That concrete wall looming large on your right hand side. Bumps near the apex put your heart in your throat. I mean, we have good safety equipment, but not NASCAR spec gear so smacking the wall at those speeds would be brutal. My first qualifying session I ran a 1:15.8. Almost five full seconds off the next slowest car. 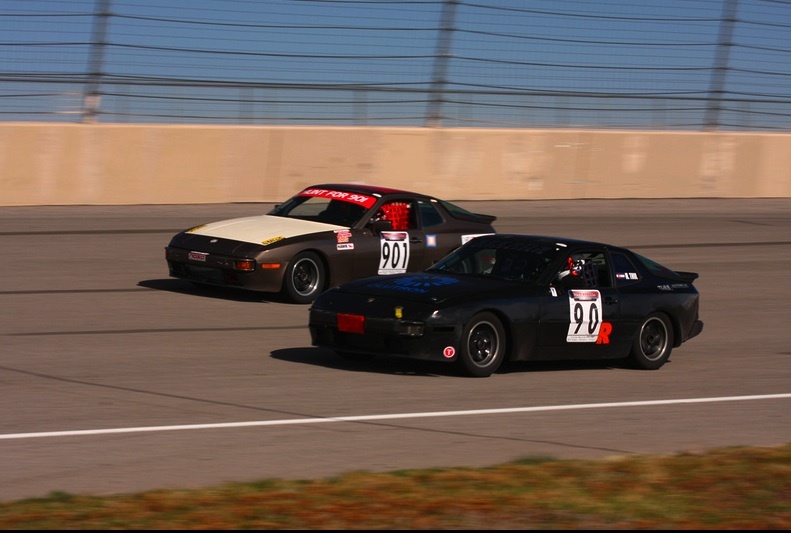 By the end of the weekend, I had run a 1:11.3 only a half-second off the slowest car. 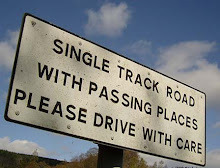 So I was quite pleased driving a new track. A car that oversteered and an old motor. My new motor will be installed this week. Goals for the year are to be able to run mid-pack. And I feel confident now I can get there. Moving up to the sharp end of the pack will take some time for sure. Note, I was so busy that I forgot to take any pictures. 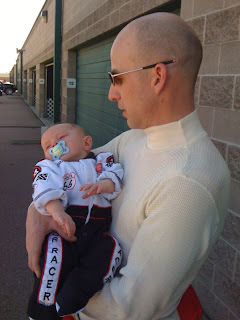 The only pic I have from the weekend was the one my wife took of me and Graham. Note his firesuit. Getting him race-ready. 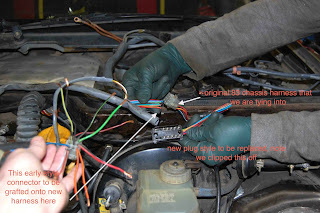 In reference to the above pictures, I took some time to remove more of the nefarious, invasive wiring from an alarm and stereo in my 82 Targa. The alarm had the most tentacles. With leads going to the decklid, trunklid, glovebox door, lights, horn, etc, etc. I take a slow methodical approach when removing wiring. And this process paid off as each wire I removed I tested for proper ignition and lighting. When I removed one wiring, I noticed the fuel pump did not trigger. So, I made a jumper wire to take the place of the alarm wiring and everything worked as the overall clad workers in Germany intended. I do have a question to my readers? See the close up on the one wire. This was stuck to the shift rod tunnel with wires that led to the stereo and amplifier I previously removed. What is it for? Static? Ambient sound? What? Check Your Hoses. So, with the first 944 SPEC race in less than a week I decided to start up the 901 and see if would run. 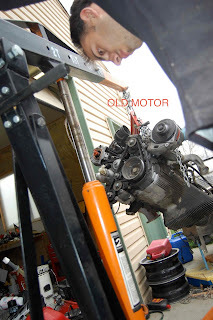 I am using the old motor for the first race. Approaching the car I saw a puddle under the front that I thought was rain water or snow melt. But, it was antifreeze. Ugh. It looked like the plastic around the temp sender was cracked. So, I started the car in hopes it would make the leak more obvious. It did, once up to temp, I could see steam wisping from around the top radiator hose. A screwdriver set to the clamp proved it loose by three full turns! Was I limp wristed when I installed it last year? But, good maintenance to do.